Q4LT is writing on the Svbtle network. There’s been quite a buzz in the DMT discussion circles regarding a recent presentation made by Dr. Dave Nichols at the Breaking Convention conference. In this presentation (which we have embedded at the bottom of this piece), Nichols makes the case for DMT and the pineal gland as not being predominant factors as it pertains to mystical experiences with a focus on the near death experience (NDE). While I enjoyed the presentation as it provided insights into yet another endogenous compound (Dynorphin) that correlates with significantly altered states of consciousness, I found that there seem to be some missing pieces to Nichols’ research that might provide deeper insights to the “Endohuasca” puzzle and NDE’s. I’ve used the term “Endohuasca” in the past to describe some of the endogenous compounds that might provide the answers to generating altered states of consciousness without exogenous chemical stimulants. We cited not only N,N-dimethyltryptamine (DMT), 5-methoxy-N,N-dimethyltryptamine (5-MEO), and 5-HO-DMT (Bufotenin) but also the endogenously produced mono amine oxidase inhibitors (MAOIs) known to date (MAO-AI’s: Pinoline, Tryptoline, Harmane, Neurocatin, Tribulin A, Isoquilonium Derivatives (Salsolinol, 1MeTIQ) & MAO-BI’s: Phosphatidylserine, Quinolinic Acid, Tribulin B). *Rines is a MAO-A activity regulator. While the shamanic brew, Ayahuasca is comprised of a N,N-DMT containing plant (Psychotria Viridis) and a MAOI containing plant (Banisteriopsis Caapi), the “Endohuasca” system appears to have many “moving parts”. I would even venture to state that endogenous compounds such as Adrenochrome, Morphine, and Dynorphin have the potentiality to be “in play” alongside the DMT’s and MAOI’s during our moments of “Endohuasca activation”. 1 - DMT is not produced in concentrations significant to activate CNS-5HT2A receptors, and is rapidly broken down by MAO if it is produced. In 2013, the Journal of Neuroscience published a study confirming the notion that activation of the 5-HT2A receptor underlies the visual hallucinations from psilocybin ingestion. An unconnected study in 2012 observed that 40mg of Ketanserin effectively suppressed the effects of psilocybin in humans. LSD-Ketanserin studies have also been published with similar projected results but from my knowledge there haven’t been any human studies to date. It is much more difficult to quantify the effects or subsequent suppression of the effects of psychedelics in non-human models. If activation of the 5-HT2A receptor is truly the dominant mechanism for all psychedelic induced visual hallucinations, it would seem that utilizing 40mg of Ketanserin would effectively suppress experiences during Ayahuasca and potentially “Endohuasca” as well. In 2016, the journal European Neuropsychopharmacology would publish a study regarding the effects of 40mg of Ketanserin (5-HT2A antagonist) as it pertains to a medium dose of Ayahuasca. The study found that instead of the complete suppression of the effects as seen in the psilocybin study, there was only a 62% reduction in Affect, 56% reduction in Perception, and a 36% reduction in Intensity. These results are intriguing as it alludes to the fact A) the effects of DMT might potentially correlate with receptors other than 5-HT2A and B) monoamine oxidase inhibitors (MAOIs) could possibly play a key role in hallucinatory activity outside of simply the suppression of DMT via deamination. A 1990 study in the Journal of Neural Transmission would observe changes in the number of Ketanserin binding sites from Tribulin derivative Isatin (an endogenous MAOI). A 2000 study in the journal Antioxidant and Redox Signaling would observe a 16.9% decrease in ketanserin binding to 5-HT2A receptors in the frontal cortex of mice from Gingko Biloba (which contains MAOI Kaempferol). There are also the factors of DMT/5-MEO/Bufotenin and their numerous known receptor affinity other than 5-HT2A such as: 5-HT7, 5-HT1D, 5-HT2B, Alpha-2B, Alpha-2C, D1, 5-HT2C, 5-HT1E, 5-HT6, 5-HT5A, Imidazoline-1, Alpha-1B, Alpha-2A, Alpha-1A, SERT, Sigma-1, 5-HT1A) as well as hundreds of orphan G-protein-coupled receptors (GPCRs). There also lies the potentiality for DMT/5-MEO/Bufotenin affinity for Trace Amine-Associated Receptors (TAARS) and Metabotropic Glutamate receptors (mGluR2). In essence, I wouldn’t place so much emphasis on one receptor (5-HT2A) based on the fact that Ketanserin failed to provide full spectrum suppression of the effects of a medium dose of Ayahuasca. Coupled with the fact that 5-HT2A antagonist binding sites seem to be altered by MAOI’s only complicates the matter even further. We’ll address the rapid breakdown of DMT(s) by MAO later on in this piece. 2 - There is no evidence to suggest that DMT can be accumulated in the brain or within neurons at significant concentrations; such inferences either are not supported by direct experimental evidence or are based on flawed experiments. My perspective of the activation of the Endohuasca system (which includes but is not limited to N,N-DMT) is that the measurement would need to retain the utmost integrity of the precise physiological environment in order to get an accurate reading. I don’t believe this is possible utilizing our current methods of measurement. What I mean by this is that in speculating that “dream sleep” correlates with upregulation of Endohuasca release… that there is a correlation in increased cranial cerebrospinal fluid (CSF) volume/pressure, cerebral blood flow velocity, rhythmic respiratory function, SCN oscillation increase, ionic fluctuations, and many others. In order to accurately measure whether DMT/5-MEO/Bufotenin can exist in “significant” concentrations in the brain, we would need to be able to take live samples of hundreds (maybe thousands) of locations within the brain during these “dream sleep” moments without disturbing the natural fluid exchange/equilibrium that coincides with these states. Any deviation from the natural state allows the potential for reactions that are unaccounted for. This is essentially impossible as we would need to crack open a human skull while they are still alive and take brain tissue samples real-time during the moments of “dream sleep”. We must remain cognizant of our equipmental limitations as it pertains to realistic and accurate postulations for both sides of the discussion. We must also remain aware that the effects of exogenous N,N-DMT are not only directly related to the compound itself but also the cascade effect it has on other biochemical release such as corticotropin, cortisol, prolactin, and growth hormone. The human body is an unequivocally complex symphony of electrical and biochemical activity which makes it extremely difficult and perhaps overly reductionist to attribute a cascade effect to one specific compound. 3 - Endorphins, especially dynorphin, are released during stress, and dynorphin has a very high affinity for the kappa opioid receptor, which can mediate hallucinations and out of body experiences. Other endorphins can mediate euphoria and analgesia. Very good point and an additional potential biochemical to add to the Endohuasca soup! The one note I’d like to make in regards to this comment is that there lies the potentiality that dynorphin is not only released during high stress but potentially deep relaxation as well (meditation, sleep, hypnosis). 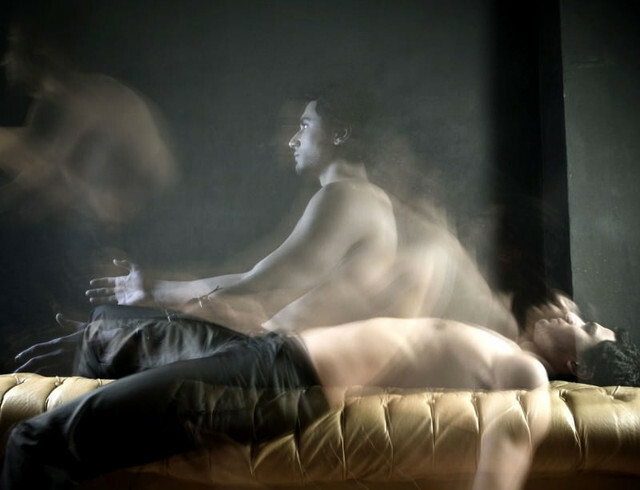 Out of body experiences (OBEs) and hallucinatory phenomena have been reported during hypnagogic states as well as high stress moments so we must remain cognizant that there are multiple pathways to similar phenomena. A 1983 study published in Science would observe circadian based fluctuations of dynorphin in the hypothalamus of rats. It was observed that there was a 500% surge in dynorphin concentrations from 12am to 4am compared to waking state hypothalamic dynorphin levels. A 1999 study in the European Journal of Pharmacology would observe increased dynorphin A release in cerebrospinal fluid following intrathecal THC administration. I’d be interested to see future studies monitor the levels of dynorphin following Ayahuasca, DMT, and 5-MEO/Bufotenin administration. Much like Nichols’ cites endorphin/dynorphin release during stress… it’s been observed that endogenous monoamine oxidase inhibitors (MAOI’s) such as Tribulin, Pinoline, and Harmane are also activated during stress exposure. Perhaps this adds some value to speculation of the DMT’s role during these altered states? In the video below, Dr. Steven Barker discusses data from the unpublished dissertation by Dr. Robert Harrison of the University of Alabama at Birmingham. Barker states that rats placed in stressful conditions of swimming to exhaustion or kept in isolation exuded greater levels of N,N-DMT in their brains as well as adrenal glands. He also described an experiment in which LSD was administered to rats which subsequently increased their endogenous levels of 5-MEO-DMT by 1000% and N,N-DMT by 400%. According to Barker, Dr. Harrison’s untimely death was the reason for the lack of publishing of these studies. There lies the possibility that dynorphin and DMT/Endohuasca play a role in mediating the phenomena during severely altered states of consciousness. 4 - Asphyxiation or cardiac arrest paradoxically lead to brain activation and result in marked increases of brain neurotransmitters such as dopamine, norepinephrine, and serotonin, the latter of which can stimulate 5-HT2A receptors. *It’s interesting to note two separate studies (Brain Research 1985 & Physiology and Behaviour 1987) that showcase the reversal of the analgesic effect of 5-MEO-DMT when norepinephrine levels are depleted. In essence… this is quite a complicated orchestra. 5 - Asphyxia induces excessive release of the excitatory amino acid, glutamate. Drugs such as ketamine, which also raise cortical glutamate, can produce out of body experiences. This would lead us to believe that if there is an underlying mechanism in which our MAO activity could be suppressed via endogenous mechanisms, there lies the potentiality that DMT could be preserved for long enough to subsequently provide a significant effect. While there lies the potentiality that I’m way off base… if asphyxia induces excessive release of glutamate… and glutamate increases the formation of hydroxyl radicals (•OH)… and hydroxyl radicals (•OH) reduce both MAO-A and MAO-B activity up to 70-80%… and MAO is predominantly responsible for the breakdown of DMT’s… then there lies the possibility that DMT preservation and activation is “in play” during these glutamate spike moments. It wouldn’t be too far-fetched to presume this based on the observations that DMT has displayed neuroprotective effects against hypoxia. Since we’re on the topic of glutamate we might as well cite other instances in which significant increases in glutamate take place. A 2002 study in the journal Critical Care Medicine would observe a nearly 400% increase in cerebral extracellular glutamate levels from baseline due to 30 minutes of hyperventilation. A 2008 study in the American Journal of Physiology - Regulatory, Integrative, and Comparative Physiology observed significant fluctuations of glutamate levels in the posterior hypothalamic region of the brain during REM sleep onset. As outlined extensively in the piece “Measuring DMT Formation in Humans” we present the evidence that respiratory fluctuation (loud, thunderous snoring) during sleep cycles appear to directly coincide with the most prominent/vivid dream states (REM sleep). 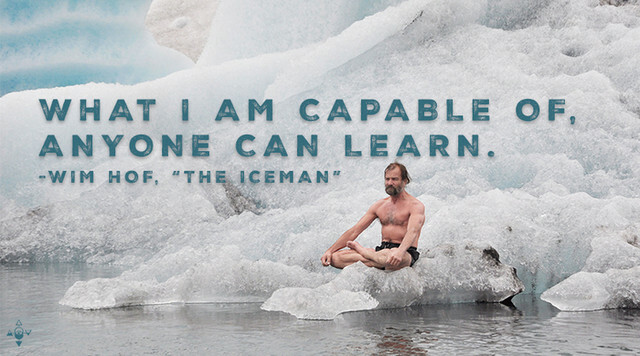 We also speculate that induced altered states from respiratory techniques such as Wim Hof Method, Holotropic breathwork, and traditional yoga such as Pranayama are likely based on similar mechanisms. During the presentation, Nichols postulates that the surge in brain activity during NDE’s is a mechanism in which the body is attempting to “fix” problems throughout the body. While this could very well be possible… it’s also quite possible that the Endohuasca system is extremely active during those moments simply from observing the significant suppression of MAO activity from hydroxyl radical formation due to glutamate spikes. It would be interesting to observe what effects hydroxyl radicals play on endogenous monoamine oxidase inhibitor levels. That’s a study that needs to be made in the future. For evidence that there appears to be an upregulation of pineal gland activity during moments of stress, a 2008 study in the Journal of Cerebral Blood Flow & Metabolism observed a 500% increase of melatonin in the cerebrospinal fluid following traumatic brain injury. Interestingly enough, melatonin levels in the blood increased only 50% by comparison. This is important to note that this is proof of not only increased pineal function as an attenuation mechanism for brain injury but also the discrepancy between the levels of biochemical measurement amongst 2 different fluids. I would presume that the timeliness and area of the measurement in congruence with injury might also showcase a distinct fluctuation. While not directly related to DMT release during induced stress, Pinoline has been identified as an endogenous MAOI that is formed from 5-methoxytryptamine (5-MeOT) which is a metabolite of melatonin. Perhaps surges in melatonin lead to increased pinoline synthesis which suppresses monoamine oxidase activity leading to the subsequent effects? *I forgot to mention earlier that alongside the DMT’s and endogenous MAOIs, I believe that melatonin is a form of biomarker for Endohuasca activation and therefore belongs in the stew. While not particularly psychoactive by any means, it seems to act like an important modulator of sorts… one cannot create a proper bowl of Endohuasca without a punch/pinch of melatonin! The levels of this compound have also been observed to surge in conjunction with increased levels of stress. *To complicate things even further… melatonin is not solely produced in the pineal gland. It has also been observed to be synthesized in astrocytes, glial cells, lymphocytes, retinal cells, digestive tract, testes, ovary, placenta, skin, bone marrow cells, mast cells, and epithelial cells… many of them being independent of photoperiod. *A 2014 review in the journal Cellular and Molecular Life provides data regarding the fact that the amount of extrapineal derived melatonin is much greater than that produced by the pineal gland. This refutes Dr. Nichols’ assertion of total daily melatonin production of 28.8μg based on blood sampling measurements from a 2001 study. It points to the fact that attempting to extrapolate blood sampling results as an accurate barometer for total production is overly simplistic by nature. Similarly to melatonin, there is the potentiality that DMT(s) are synthesized throughout the central nervous system and brain via astrocytes then released at the site of action. 6 - Although the romantic notion that DMT is released from the pineal gland to produce altered states of consciousness at various times of stress is appealing to some, science and logic suggest that other, more well studied systems provide more sound explanations for out of body experiences. I’m not going to lie… this last note comes across as a bit condescending. I’m not sure whether Nichols meant for this to come across as such but the notion that “science” and “logic” would suggest other “well studied” systems provide more sound explanations for out of body experiences seems a bit… incomplete. The human body can hardly be reduced down to one receptor or one chemical. I think in this regards I am in agreement with Nichols that it is not just the pineal gland or just DMT that induces these extraordinary experiences. I believe that it is potentially the combination of everything that he has presented, information many other researchers have discussed, some studies that I have presented throughout this site, and likely much more that is taking place during these significantly altered states of consciousness simply from a biochemical perspective. There are many additional layers of the body that must be taken into account during these moments that should be focused upon… especially the electrical component in my humble yet not so humble opinion. Reductionism whether it be in favor of the dynorphin hypothesis or the DMT hypothesis is still reductionism. It fails to take into account the enormous amount of nanosecond reactions taking place constantly throughout the body at all times. It fails to perceive the body as the ultimate gumbo of chemicals that change levels based on our respiration rhythm and depth, our visual stimulation or lack thereof, our audio stimulation or lack thereof, olfactory excitation, and many other less obvious external inputs. In the words of Dennis Mckenna… “symbiosis” dude! Nichols cites the 2013 PNAS study that measures brain activity during induced cardiac arrest in rats. It was observed that a large surge of gamma power (25 to 55 Hz) and global coherence occurred at near-death. He speculates that the brain is going on “overdrive” in an attempt to fix issues taking place in the heart. The gamma wave activity is intriguing based on the 2015 study in Cosmos & History regarding the EEG measurement of exogenous N,N-DMT, 5-MEO-DMT (synthetic), and Bufo-5-MEO-DMT (derived from Bufo Alvarius) administration. It was observed that all three DMT’s increased gamma power significantly and rather consistently. Also, very significant reversible hypercoherence in multiple bands were measured in most subjects. 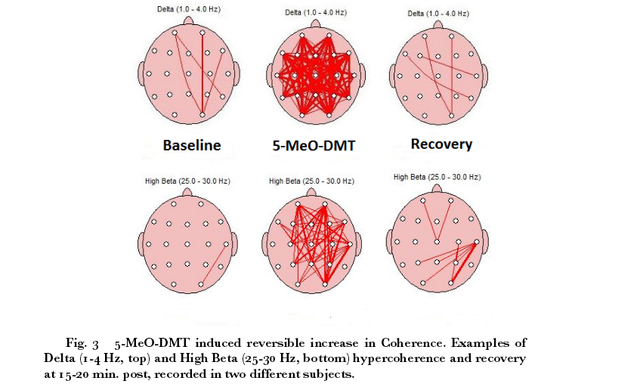 In addition to the EEG data from the DMT’s, there are multiple studies showcasing increases in global coherence as well as increase in the gamma frequency from Ayahuasca: Phytomedicine - 1998, MAPS - 2001, Journal of Psychoactive Drugs - 2005, and the Public Library of Science - 2015. It seems as though Nichols might have inadvertently supported the notion that DMT(s) might play a key role in the near death experience by citing the EEG data from induced cardiac arrest in rats. As far as I am aware… there have been no EEG studies of humans that have been administered dynorphin. However, it appears as though there are at least 8 combined EEG studies of Ayahuasca and DMT. I believe scientific speculations should be based on the best available data that exists to date. From everything that is available right now (July 13, 2017) there is more robust information pointing to a combination of monaomine oxidase inhibition and DMT(s) release that lead to the measurable brain activity (gamma wave coherence) that coincides with the near-death-experience than there is on predominantly endorphin release. But as stated prior… it’s likely both. PS. This isn’t an attack on Dr. Nichols whatsoever. This is just a continuation of an important discussion that’s taken place for thousands of years… what are the mechanics of these mystical experiences? If you appreciate the research that goes into these writings you can tip us at the Q4LT Patreon page. Thank you very much in advance! Please like my new Facebook Page for updates. You can also E-mail me at q4lt00@gmail.com or follow me on Twitter to continue the conversation.